Jeremy gave me a bamboo steamer for Christmas this year. It wasn’t at the very top of my list, but I knew he was hoping that I would keep a promise to try my hand at making gluten-free dim sum if I got one, so I offered to give it a shot for our New Year’s dinner. 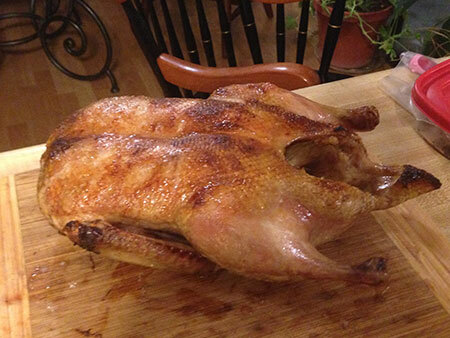 I wasn’t sure I could pull off an entire meal just of dim sum, however, so I opted to start small and make a roasted duck as the centerpiece. 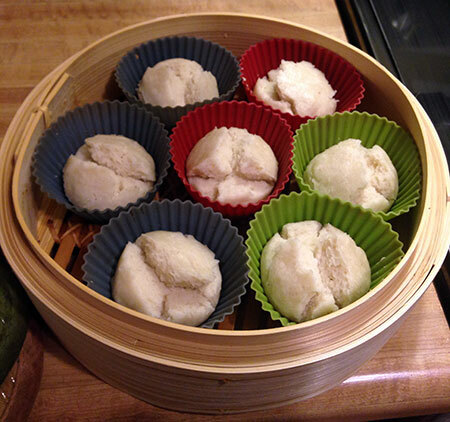 To go with it, I made trial batches of basic coconut steamed buns and pork shumai. The coconut steamed buns were about as basic as can be, coming from a Jamie Oliver recipe. I used Trader Joe’s gluten-free flour blend, which pleasantly contains no gums, and added a teaspoon of baking powder to make up for the fact that it isn’t a self-raising flour. I found these very bland but with a decent, if dense, texture; Jeremy was better pleased with them than I was. The extras turned into rocks by the next day, but were still usable as breadcrumbs, so at least they weren’t wasted. 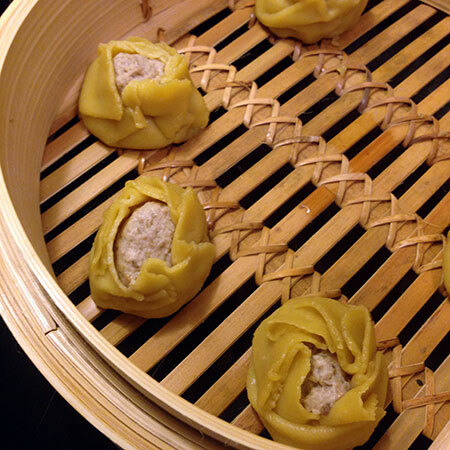 The shumai was mostly an experiment in whether or not I could use paleo egg noodle dough as a substitute for wonton wrappers. I had made primal fettuccine alfredo with shrimp a few days before using this an adaptation of this fresh pasta recipe (I added a bit of psyllium powder, subbed in 3 whole eggs plus two yolks, and did the whole dough in the food processor). I saved a bit of the dough for this very experiment, and made a simple ground pork filling by pureeing it with bok choi and shiitake mushroom, tamari, toasted sesame oil, garlic and ginger. I rolled out bits of dough into rounds and rather inelegantly wrapped them around balls of filling, then steamed them until they were cooked through. Unfortunately, it didn’t cross my mind that I would need to line the steamer with cabbage leaves or parchment paper before doing so, so they stuck pretty badly underneath. But everything else about these little dumplings felt pretty spot on to me, so I will definitely have to continue the experimentation! Shortly after New Year’s, I made a trip to the Asian Pacific Market in Colorado Springs to continue my dim sum adventures. With my pantry loaded down with fun Asian ingredients, I have been trying all sorts of dishes outside my comfort zone. First up was an effort at egg rolls, using leftover pork shumai filling as well as a new filling made with leftover duck and fresh water chestnuts. I tried out this technique calling for Paleo Wraps, which are coconut-based. My egg rolls tasted alright, but were very dark, pretty greasy, and for the most part not crispy at all: a valiant and edible effort, but not worthy of photographic documentation. 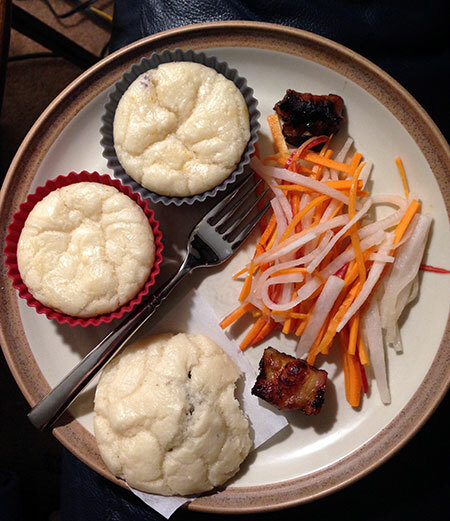 Gluten-free bao, pork and red bean filled, with bacon-wrapped water chestnuts and daikon-carrot namasu. 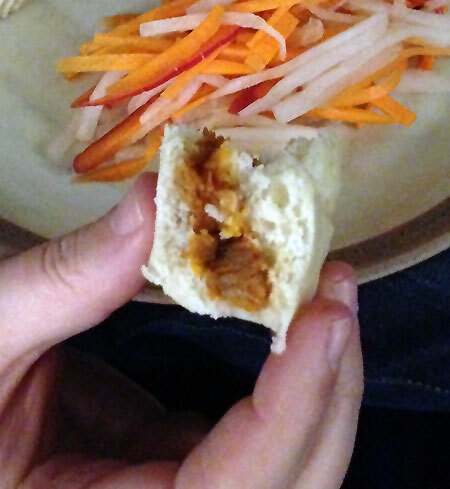 A week or two later, I tried again, this time making real gluten-free yeasted bao buns. I used the last of my packet of Trader Joe’s GF blend and this recipe, and ended up having to add an extra half-cup of the blend plus some potato starch to achieve a shapable dough that was probably still too soft. As you can see, I steamed most of the buns in muffin cups just to make sure they didn’t pancake out too much; the bun at the bottom of the above photo was steamed for comparison without a cup and actually held up slightly better than I anticipated. I served our bao with bacon-wrapped fresh water chestnuts, and a Japanese salad of julienned carrot and daikon called namasu, adapted to use lemon-flavored stevia instead of yuzu (hard to find) and sugar. Theo surprised me by begging for all of the daikon he could get his hands on. I tried two different fillings for our bao buns. The first was made with braised boneless pork short ribs in a barbecue-like sauce; this tasted good, but ended up seeming very dry once it was inside the steamed dough, so it probably needed quite a bit more sauce for moisture. The second filling was a basic sweetened red bean paste as Jeremy’s request. I made this from cooking dried adzuki beans and pureeing them with organic sugar, and it was not only a far more successful filling for the bao, but left me with quite a bit leftover. I have been slowly using up this unexpected bounty in baked goods like muffins and pancakes, so expect a post along those lines shortly!